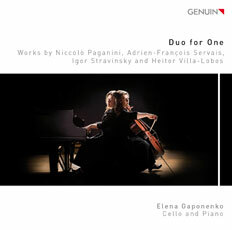 The fusion of the two artists in a duo to a perfect unity – in the debut CD of Elena Gaponenko, this is not just a wonderful illusion but a reality. The talented musician recorded both the violoncello and piano parts of the works by Stravinsky, Villa-Lobos, Paganini and Servais. With the lively chamber music found in this recording, we travel from the Shrovetide fair in Petrushka to the Italian commedia dell'arte of Pulcinella and over to the tender Brazilian miniatures for the piano.